New additions to The Dog Project Sami Griffith and Gemini completed their first scans. To accomplish this feat, Sami and Gemini needed to first pass a rigorous tryout that evaluated Gemini’s obedience, Sami’s handling abilities, Gemini’s socialization traits, and Gemini’s composure amidst multiple environmental variables, including stairs, narrow elevated walkways, enclosures, and loud noise. 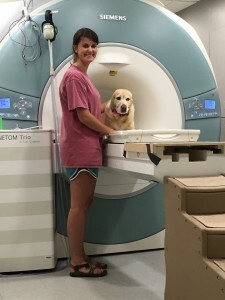 Sami Griffith and Gemini at the Emory University MRI scanner. After passing the tryout, Sami and Gemini participated in several months of detailed instruction to learn the conditioning, behavior shaping, positive reinforcement, and behavior chaining protocols required to properly perform the MRI behaviors. Once mastering the protocols, they needed to pass an exam that included a full dress rehearsal that duplicated all the variables and procedures present during a live MRI. Upon receiving approval from The Dog Project management team of CPT Head Trainer Mark Spivak, Emory Professor Greg Berns, and Emory Postdoctoral Researcher Peter Cook, Sami and Gemini scheduled their first live scan. Due to outstanding abilities and hard work, they flew through their Experiment 1 scan. We look forward to many more scans from Sami and Gemini as we introduce experiments on reward preference, expectation violation, jealousy, and olfaction.